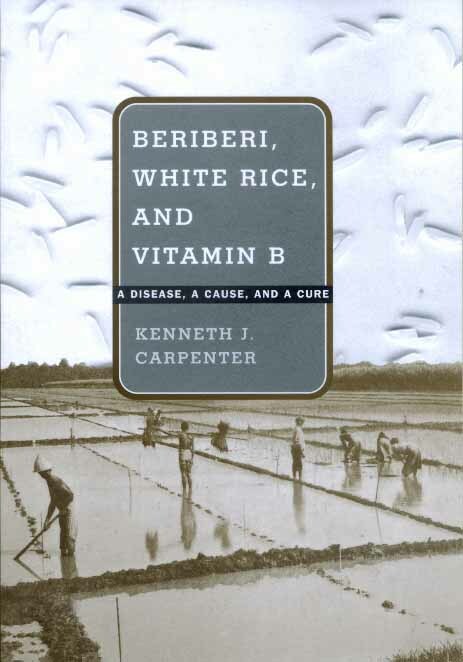 In this comprehensive account of the history and treatment of beriberi, Kenneth Carpenter traces the decades of medical and chemical research that solved the puzzle posed by this mysterious disease. Caused by the lack of a minute quantity of the chemical thiamin, or vitamin B1 in the diet, beriberi is characterized by weakness and loss of feeling in the feet and legs, then swelling from fluid retention, and finally heart failure. Western doctors working in Asia after 1870 saw it as the major disease in native armed forces and prisons. It was at first attributed to miasms (poisonous vapors from damp soil) or to bacterial infections. In Java, chickens fed by chance on white rice lost the use of their legs. On brown rice, where the grain still contained its bran and germ, they remained healthy. 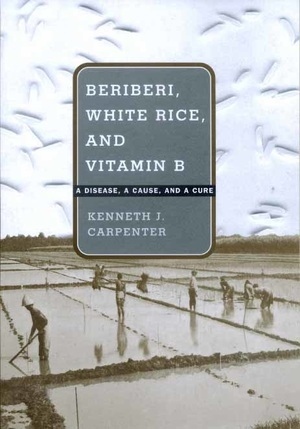 Studies in Javanese prisons then showed beriberi also occurring where white (rather than brown) rice was the staple food. Birds were used to assay the potency of fractions extracted from rice bran and, after 20 years, highly active crystals were obtained. In another 10 years their structure was determined and "thiamin" was synthesized. Beriberi is a story of contested knowledge and erratic scientific pathways. It offers a fascinating chronicle of the development of scientific thought, a history that encompasses public health, science, diet, trade, expanding empires, war, and technology. This is a medical detective story: beginning with the investigation of a disease that has killed or crippled at least a million people, and then following up clues that ranged much wider. One outcome was the production of a synthetic chemical that we now, nearly all of us, consume in small quantities each day in our food. The detectives had a variety of professions and spoke different languages. Their work ranged from studying the health of laborers in a primitive jungle to the painstaking dissection of individual grains of rice under a microscope. The integrated story of their struggles and successes, culled from old volumes in scattered libraries, forms the subject of this book. Kenneth Carpenter is Professor Emeritus of Nutrition at the University of California, Berkeley. His books include Protein and Energy (1994) and The History of Scurvy and Vitamin C (1986).